When it comes to effectively marketing your business, Graphically Innovative Designs is here to help you with all your graphic design needs. 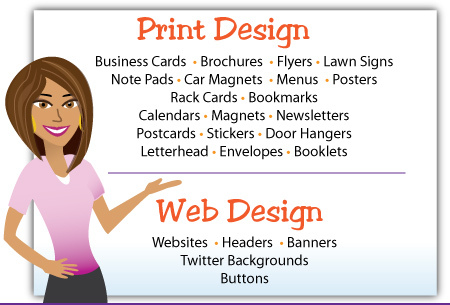 Click on the buttons below to learn more about my Web and Print Services. Why Choose Graphically Innovative Designs? If you're not convinced yet as to why you should use Graphically Innovative Designs, here's 5 reasons why. Too, see what my clients have said about me and my services. Personal customer service. You'll receive one-on-one attention as we work together on your project. Since I am the sole designer and operator, you're working with one person, not five, thus reducing lost conversations and misunderstandings. High quality work. My job is to make you and your business look good. So for print jobs I use sturdy paper stocks and quality printers. And, when it comes to web design projects I do cross-browser testing and make sure your website is validated. Convenience. You've heard the saying, "Time is Money and Money is Time." Well, when you work with me, you won't have to take precious time out of your busy schedule to meet in person. In order to save you valuable time, money... and frankly gas, Graphically Innovative Designs is primarily an online business for your convenience. Direct and fast communication. Throughout the course of your design project, most communication is done electronically via email, telephone, and fax. So, you can rest assured that I'm just a call or click away. I, as well as past customers of mine, like the speed and ease of using email to communicate. A dedicated business owner and designer. Graphic design comes second nature to me. Just about all my life, I have been designing and drawing. Besides having a love for design, I'm a small business owner like you. I have gone through some of the same challenges you have and may be going through. That is why I feel I have an advantage over other graphic designers. I can put myself in your shoes. If you would like to work with me or would like to request a quote, don't hesitate to ask. Just contact me to get started!